The 62 million year fossil diversity cycle is most evident in the historical records of genera that survived less than 45 million years. A genera is a group of similar species. Curiously, some organisms seem immune to the cycle. Corals, sponges and trilobites follow the cycle, while fish, squid and snails do not. The rise and fall of species on Earth might be driven in part by the undulating motions of our solar system as it travels through the disk of the Milky Way, scientists say. Two years ago, scientists at the University of California, Berkeley found the marine fossil record shows that biodiversity-the number of different species alive on the planet-increases and decreases on a 62-million-year cycle. At least two of the Earth's great mass extinctions-the Permian extinction 250 million years ago and the Ordovician extinction about 450 million years ago-correspond with peaks of this cycle, which can't be explained by evolutionary theory. Now, a team of researchers at the University of Kansas (KU) have come up with an out-of-this-world explanation. Their idea hinges upon the fact that, appearances aside, stars are not fixed in space. They move around, sometimes rushing headlong through galaxies, or approaching close enough to one another for brief cosmic trysts. In particular, our Sun moves toward and away from the Milky Way's center, and also up and down through the galactic plane. 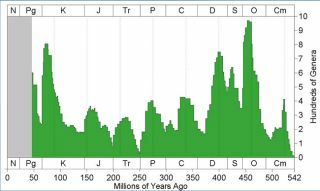 One complete up-and-down cycle takes 64 million years- suspiciously similar to Earth's biodiversity cycle. The KU researchers independently confirmed the biodiversity cycle and have proposed a novel mechanism by which the Sun's galactic travels is causing it. Scientists know the Milky Way is being gravitationally pulled toward a massive cluster of galaxies, called the Virgo Cluster, located about 50 million light years away. Adrian Melott and his colleague Mikhail Medvedev, both KU researchers, speculate that as the Milky Way hurdles towards the Virgo Cluster, it generates a so-called bow shock in front of it that is similar to the shock wave created by a supersonic jet. "Our solar system has a shock wave around it, and it produces a good quantity of the cosmic rays that hit the Earth. Why shouldn't the galaxy have a shock wave, too?" Melott said. The galactic bow shock is only present on the north side of the Milky Way's galactic plane, because that is the side facing the Virgo Cluster as it moves through space, and it would cause superheated gas and cosmic rays to stream behind it, the researchers say. Normally, our galaxy's magnetic field shields our solar system from this "galactic wind." But every 64 million years, the solar system's cyclical travels take it above the galactic plane. "When we emerge out of the disk, we have less protection, so we become exposed to many more cosmic rays," Melott told SPACE.com. The boost in cosmic-ray exposure could have both a direct and indirect effect on Earth's organisms, said KU paleontologist Bruce Lieberman. The radiation could lead to higher rates of genetic mutations in organisms or interfere with their ability to repair DNA damage, potentially leading to diseases like cancer. Cosmic rays are also associated with increased cloud cover, which could cool the planet by blocking out more of the Sun's rays. They also interact with molecules in the atmosphere to create nitrogen oxide, a gas that eats away at our planet's ozone layer, which protects us from the Sun's harmful ultraviolet rays. Richard Muller, one of the UC Berkeley physicists who co-discovered the cycle, said Melott and his colleagues have come up with a plausible galactic explanation for the biodiversity cycle. Muller and Robert Rohde also speculated that our solar system's movement through the galactic plane was behind the cycle, but the pair could not conceive of any reason why conditions on the north and south side of the galactic plane should differ. "That's where they succeeded," Muller said in a telephone interview. "They came up with something we didn't think of, which puts an asymmetry in. I'm delighted they did that and I congratulate them." Richard Bambach, a paleontologist at the Smithsonian Museum of Natural History who was not involved in the study, said he is excited the biodiversity cycle has been independently confirmed, but cautions the galactic hypothesis is still in the early stages of formulation. "It's a first-step hypothesis," Bambach said. "It's an interesting idea, but we're a long way from knowing if that is really why biodiversity changes." For one thing, scientists have yet to discover a bow shock around the Milky Way, though such shock waves have been found around other galaxies. "I think it's a very nice idea," said Philip Appleton, a Caltech astronomer. "I think we're only beginning to come to grips with these kinds of behaviors. We're realizing that not only do galaxies interact with each other gravitationally, but also that the environment they're traveling through-the 'wind' they create-can actually produce noticeable effects." Last year, Appleton and his team discovered a bow shock surrounding a galaxy in Stephan's Quintet, a galactic cluster located 300 million light years away. The shock wave is traveling about 620 miles (1,000 km) per second relative to the cluster. The Milky Way is hurtling toward the Virgo Cluster at about 125 miles (200 km) per second, so any bow shock it generates would consequently be weaker, Appleton said. If future studies confirm the galaxy-biodiversity link, it would force scientists to broaden their ideas about what can influence life on Earth. "Maybe it's not just the climate and the tectonic events on Earth," Lieberman said. "Maybe we have to start thinking more about the extraterrestrial environment as well."